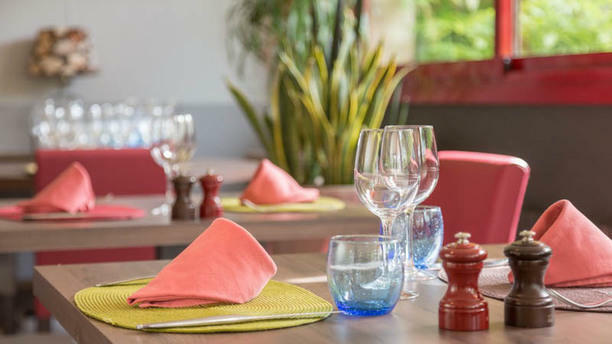 Le restaurant La Terrasse Fleurie, situé en plein cœur de la ville thermale de Divonne-les-Bains, entre le lac Léman et les montagnes du Jura, vous accueille dans un cadre bucolique. La salle offre une décoration contemporaine et une ambiance cosy qui saura vous plaire. Côté menu, vous vous régalerez avec la cuisine française traditionnelle du Chef. Il compose des mets fins et savoureux qui exalteront vos papilles de fin gourmet. En entrée, laissez-vous tenter par Foie gras poché au vin rouge épicé, suivi du Filet de daurade royale rôti. Et, terminez en beauté avec le Beignets Divonnais ! Après ce délicieux repas, vous pourrez faciliter la digestion par une petite balade au pied des montagnes du Jura. Very nice restaurant, good food and gentle service! Like much of Divonne, not quite there. The food was ok, the atmosphere was too bright and lacking amience. It felt like a cafeteria. The food was ok, but nothing special, and this is rated quite highly in Divonne. Staff was friendly but a bit harried. As i said, didnt quite get there. Excellent value for money. Served by most pleasant staff. Definitely will return. Very nice dinner, fish especially (trout). Good look & feel of the food. Low quality of the house-wine/vin-ouvert (red). Some dishes/desserts not available, maybe because it was a Sunday night. Jolie expérience avec personnel attentionné. On y retournera! The food was HORRIBLE! Seriously. I wish I had something nice to say. Excellent kitchen, very friendly staff. 5 stars! We had a lovely diner. Service very fast and professional. Food very tasty and apetizing. We recommend. Friendly service. Great food. Well priced. Excellent French food; it exceeded my expectations. I had the foie gras, followed by poulet de bresse. The amuse bouche was a carrot soup. The servers were pleasant and helpful although at one point it seemed they were doing their best to manage many tables between just two of them. The bright lights struck me as odd when I walked in, and I think it would have been better if they were dimmed a bit. It’s a minor criticism since the meal was otherwise so enjoyable. A good option as always. Good food quality, nice setting, nice service. Certainly a recommendation if you come by Divonne. I felt the menu had less choice than other times but it had been a while since my last time. if the cook had a bad day. The amuse geule on the house was actually very good and nicely presented. Very nice food, ambiance and good service! The food was excellent and the service was friendly and helpful. A really good dinner, thank you. The menu of this restaurant includes a number of dishes made with products from the region in an inventive way. the food was tastey altho the chicken from Bresse was a bit tough. The service was good and friendly but not pretentious. We like to go here also because it is quiet and an excellent value for money.